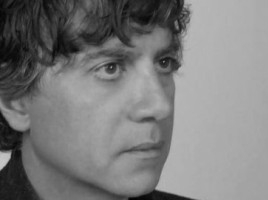 On Thursday August 21st, Philip Rosedale announced that Tony Parisi has joined High Fidelity. Tony has just joined us as an advisor, and is also working with us on some secret High Fidelity stuff that is coming soon. He’s a perfect person to add to the High Fidelity team. Tony Parisi is the co-creator of the VRML and X3D ISO standards for networked 3D graphics, and a 3D technology innovator. He’s a career CTO / software architect and entrepreneur, has and is serving on a number working groups, and may also be familiar to some as one of the SVVR Creating the VR Metaverse panel in April 2014. More recently, he was featured in a Drax Files Radio Hour feature-length interview, which I also reviewed (and am embedding again at the end of this piece, as it really is worth listening to if you missed it the first time around). 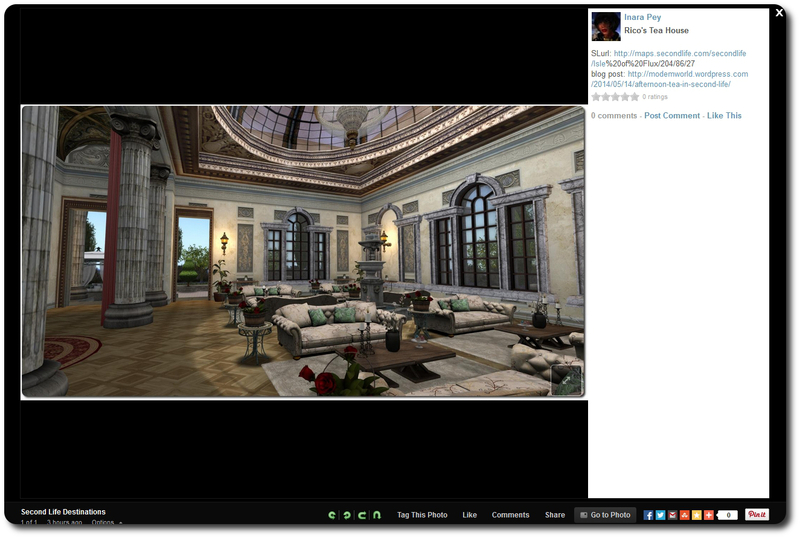 What we are building at High Fidelity is a bigger project than any one designer or company. To bring virtual reality to everyone will mean a broad set of standards and open systems, and Tony has been designing and championing big pieces of those standards for his whole career, most recently with WebGL. There can be no doubting Tony’s background and understanding of the potential for consumer-focused VR – again, just listen to the interview below for proof of that. So interesting times at High Fidelity just got more interesting! During the Server Beta meeting on Thursday August 21st, it was confirmed that the first region to be rated a Skill Gaming region had arrived on the main grid. The region – called “Crunchy”, isn’t actually open for gaming; it’s a test area currently being poked at by Gecko Linden. In addressing the arrival of the region, Simon Linden pointed to the Skill Gaming Approved Participants wiki page, and I noticed that the first set of Skill Gaming operators and the first batch of games have now been listed. The test region is already set-up to exclude access to avatars which don’t meet the access requirements, which can be found in the Skill Gaming FAQ and on the Approved Participants wiki page. The access restrictions appear to work, as I was unable to reach the test region with my Crash Test Alt, but could enter it without a hitch with my primary avatar account. There are some other tests going on in the region which are likely to be readily to performance testing, etc; robots fly and shoot, MOAP boards are displayed (and Gecko Linden seems to be a bit of a space science fan, like me). Some 45 games (a fair few of them variations on Solitaire) were added to the Approved Participants wiki page on Thursday August 21st, split among a number of operators. In addition, some 30 Skill Gaming regions were listed as approved as Skill Gaming regions, although they have yet to actually be converted to the new region type. With the revised September 1st deadline looming for the introduction of the updated Skill Gaming policy, these additions are the first sign that people are actually applying to become operators / creators, and it will be interesting to see how many more appear over the course of the next week. As it is, there still seems to be a lot that is still up-in-the-air with regards to the Policy and its associated FAQ – the latter of which hasn’t been updated since August 7th. One area still to be cleared-up is that of quarterly fees, which may well be delaying some from applying to become licensed operators / creators. The lack of any clear indication of the fees was raised as a matter of concern at the August 2nd presentation Agenda Faromet gave on both Skill Gaming and the July Terms of Service update (transcript and notes to both available here). In many respects, it is hard to understand why the Lab hasn’t announced quarterly fees. According to the FAQ, they are in respect of are in respect of “processing and compliance-related costs associated with maintaining this program”. Taking this as the case, then it’s not unreasonable to assume the Lab has an idea of the compliance related costs and other fees they are themselves facing in order to allow skill gaming on their platform, and so should have some idea of what the quarterly fees are likely to be. This is not to suggest the Lab are attempting anything untoward in not revealing the fees; a was pointed out during the SLBA presentation, the likely reason the fees haven’t been announced is because the Lab have (or hadn’t at the start of August) got that far in their thinking. Even so, it is potentially causing people to hold off applying. What also doesn’t help the Lab here is that Skill Gaming regions already have a higher tier associated with them ($345 + VAT where applicable) “due to the greater degree of ongoing administrative work associated with administering our rules concerning Skill Gaming in these regions”. So applicants are faced with that, the application fee, the cost of converting their existing regions – and then still have a possibly large question mark hanging over their potential total operating costs. There are other aspects of the process that would seem to need clarification or risk confusion. As Ciaran Laval pointed out on August 13th, it has been suggested (not by the Lab, admittedly), that SL-focused stock exchanges are possibly exempt from the updated policy, but at least one is going through the application process (SL CapEx, again as indicated by Ciaran); ergo, further clarification on the status of exchanges would perhaps be welcome. There is also the requirement (section 9 of the FAQ), that applicants engage a US-based and licence attorney to help with the legal aspects of their application (e.g. provisioning their RLO). However, this hardly seem correct when it comes to applicant from outside the USA, as a US attorney is unlikely to know the gaming laws applicable to another country (or can even give a legal opinion on the laws of another country). So where does that leave applicants from outside of the USA? Again, further clarification might well be welcomed. In his article, Ciaran notes the fact that the Lab are willing to push back on the date from which the new policy comes into effect is good – and I agree (although like him, I’d also like to se some indication on whether they are also willing to push back the date from whence the nebulous quarterly fees kick-in). But that said, the fact that more than a month after the updated policy was first announced people are still waiting for clarification on some matters relating to its introduction, does suggest the Lab has perhaps put the cart before the horse (and I admit, I’m tempted to put “again” at the end of that sentence). Obviously, those wishing to create and / or operate games of skill have little choice but to comply with the new policy. Even so, it would perhaps be nice if the Lab didn’t continue to give the impression that the best way for people to decide whether they want to be or not is down to a roll of the dice, the current batch of applicants listed on the wiki page notwithstanding. There was no deployment on the Main (SLS) channel on Tuesday August 19th. All three RC channels received the same server maintenance project on Wednesday August 20th, aimed at fixing a crash mode. There may be news on the crash mode fixed in the RCs once it has deployed to the Main (SLS) channel in week 35. A “re-fix” for BUG-6466 – “Numbers expressed in scientific notation and include a plus sign in the exponent are not parsed as JSON numbers by LSL”, which was thought to have been fixed a while ago, but which in fact resulted in BUG-6657 – Valid JSON numbers like 0e0 no longer valid after 14.06.26.291532. prompting the original fix to be rolled back. TPV developer Niran V Dean has been working on a new unified snapshot floater which encompasses the “standard” floater, plus the Flickr, Twitter and Facebook upload options, under STORM-2040. Those who use the most recently releases of Niran’s Black Dragon viewer will be familiar with the approach, as he initially worked on the idea in that viewer. The work is now progressing to a point where we should be seeing the fruits of his labour in the near future. In the meantime, I’ve previewed the work as it stands at the moment. The viewer currently fetches all meshes and textures through the sim, which gets them from the asset server, and the sim gives the viewer a ‘capability’ URL, which the viewer uses for fetching. However, with this change to use the CDN, the sim instead gives the viewer the URL of the CDN, and the CDN has hosts all over the world. It’s good for two reasons: 1) the sim isn’t burdened with texture/mesh transfers; 2) you’ll often have lower latency to the CDN than the sim, which means more speed. 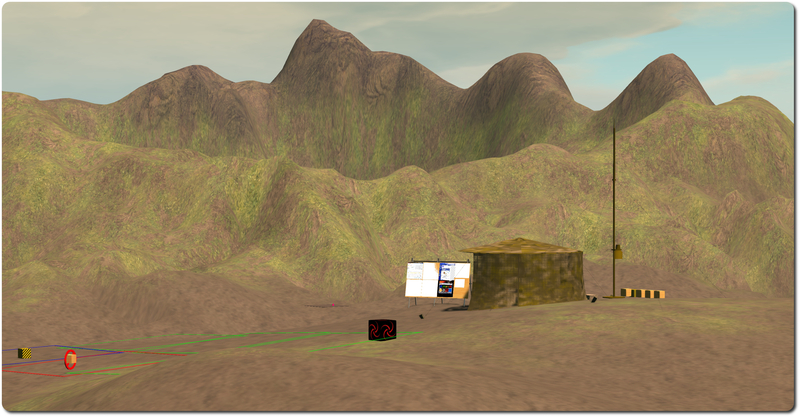 Allowing for the fact the Lab is accessing the service through their own network (although the CDN is a commercial service), both Maestro and April Linden report it as being a noticeable improvement on things, with texture and mesh fetching having double the performance compared to the current means of fetching via the simulator. Initial results of testing from Europe show similar improvements. The Server Beta meeting agenda has further information on new method for mesh and texture fetching, including details on the Aditi stress test regions (one for textures, one for meshes), and those wishing to try them out are invited to do so. No special viewer is required in order to carry out testing at present, and the agenda includes notes on what to do. Note that the test regions are set to no-build so that people don’t rez extra things that would skew results; they are also likely to be limited in terms of the maximum number of avatars able to access them at one time. If / when the new approach is more broadly rolled-out, people will be able to see which service (CDN or via the simulator) they are using is to set Develop > Consoles > Capabilities Info To Debug Console. Those using the CDN will see the GetMesh, GetMesh2, and GetTexture URLs will all be http://asset-cdn.aditi.lindenlab.com/, while those using the current method will see it give some URL pointing at the sim host. However, we’re still some way from seeing the new service deployed further than the Aditi test regions. Should this work prove successful, and once it and other HTTP work such as pipelining, as being developed by Monty Linden, is completed, the Lab hopes that they’ll have a fast, robust series of HTTP services such that they can look to retire UDP texture fetching – although this will be some way down the road, and in the interim, UDP will offer people something of a fallback for texture fetching should they have issues with HTTP as the various new services are deployed. 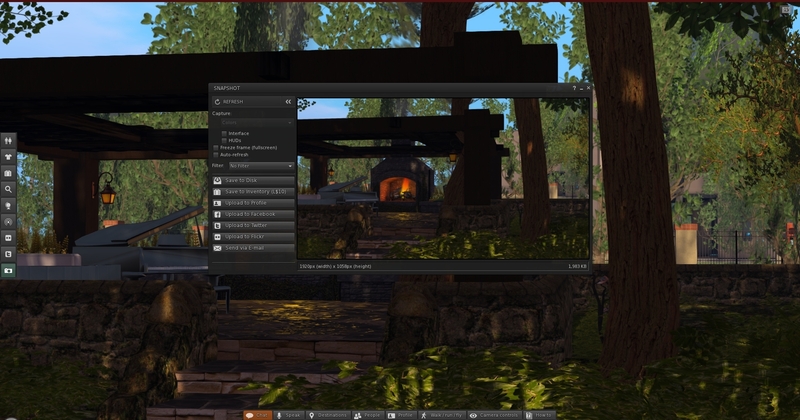 Simon Linden reported that the first of the Skill Gaming regions has arrived on Agni (the main grid). Called Crunchy, it doesn’t have any gaming parlours or anything on it, but appears to be set-up for testing (such as accessibility). There are a few things going on there, most under the control of Gecko Linden. Also, and as pointed-out by Simon, the first skill games and operators have started to appear on the Lab’s Skill Gaming Participants wiki page. Work has resumed on group chat after a brief pause, and the Server Beta meeting saw a very brief test take place. The aim of this was to test delays that have been introduced into the members list updates sent by the chat server. As I’ve previously reported, one of the biggest issues of chat delays in group chat sessions is to do with the numbers of updates the chat server has to send as people join / leave session and log-in / out of SL, changing their online status within the groups they’re a member off. Recent changes to the code are intended to queue these updates and reduce the load they are placing on the servers, interrupting the flow of text messages. The test was brief, but appeared to give Simon Linden enough information to be able to go back and poke at things some more. There have been further reports of group chat servers at times becoming non-responsive. This issue was initially raised in week 33, after the server supporting all group chats with a key starting with “b”. A further issue was identified at the start of week 34 affecting the server supporting all group chats with a key starting with “d”. While the Lab is aware of ongoing problems, there is also a request for JIRAs to be submitted on specific issues. Update, September 8th: The unified snapshot floater is now a part of the de facto release viewer. Update, August 26th: The unified snapshot floater is now available in a release candidate viewer, version 3.7.15.293376. Niran V Dean is familiar to many as the creator of the Black Dragon viewer, and before that, Niran’s Viewer. Both viewers have been innovative in their approach to UI design and presentation, and both have been the subject of reviews in this blog over the years, with Black Dragon still reviewed as and when versions are released. Once of the UI updates Niran recently implemented in Black Dragon was a more unified approach to the various picture-taking floaters which are becoming increasing available across many viewers. There’s the original snapshot floater, and there are the Twitter, Flickr and Facebook floaters offered through the Lab’s SL Share updates to the official viewer, which are now also available in a number of TPVs. In Black Dragon, Niran redesigned the basic snapshot floater, offering a much improved preview screen and buttons which not only provide access to the familiar Save to Disk, Save to Inventory, etc., options, but which also provide access to the Flickr, Twitter, and Facebook panels as well. He also submitted to the code to Linden Lab, who have approved it, and it is currently working its way through their QA and testing cycle and should be appearing in a flavour of the official viewer soon (see STORM-2040). A test build of the viewer with the new, more unified approach is available, and I took it for a quick spin to try-out the snapshot-related changes. Note it is a work-in-progress so some things may yet be subject to change between now and release. First off, the snapshot floater is still accessed via the familiar Snapshot button, so there’s no loking for a new label or icon. The Twitter, Flickr and Facebook floaters and buttons are also still available (so if one or other of them is your preferred method of taking pictures, you can still open them without having to worry about going an extra step or two through the snapshot floater). Opening the new snapshot floater immediately reveals the extent of Niran’s overhaul – and as with Black Dragon, I like it a lot. The increased size of the preview panel is immediately apparent, and might at first seem very obtrusive. However, when not required, it can be nicely hidden away by clicking the << on the top left of the floater next to the Refresh button, allowing a more unobstructed in-world view when framing an image (you can also still minimise the floater if you prefer). Beneath the Refresh button are the familiar snapshot floater options to include the interface and HUDs in a snapshot, the colour drop down, etc., and – importantly – the SL Share 2 filter drop down for post-processing images. The placing of the latter is important, as it is the first clue that filters can, with this update, be applied to snaps saved to inventory or disk or e-mailed or – as is liable to prove popular – uploaded to the profile feed. Below these options are the familiar buttons allowing you to save a snapshot to disk, inventory, your feed or to e-mail it to someone. click each of these opens their individual options, which overwrite the buttons themselves – to return to them, simply click the Cancel button. Saving a snapshot will refresh the buttons automatically. Within these buttons are those for uploading to Flickr, Twitter or Facebook. These buttons work slightly differently, as clicking any one of them will close the snapshot floater and open the required application upload floater. While this may seem inconvenient over having everything in the one floater, it actually makes sense. For one thing, trying to re-code everything into an all-in-one floater would be a fairly non-trivial task; particularly as Twitter, Flickr and Facebook have their own individual authentication requirements and individual upload options (such as sending a text message with a picture uploaded to Twitter, and the ability to check your friends on Facebook. Also, and as mentioned earlier, keeping the floaters for Flickr, Twitter and Facebook separate means they can continue to be accessed directly by people who use them in preference to the snapshot floater. However, this latter point doesn’t mean they’ve been left untouched. 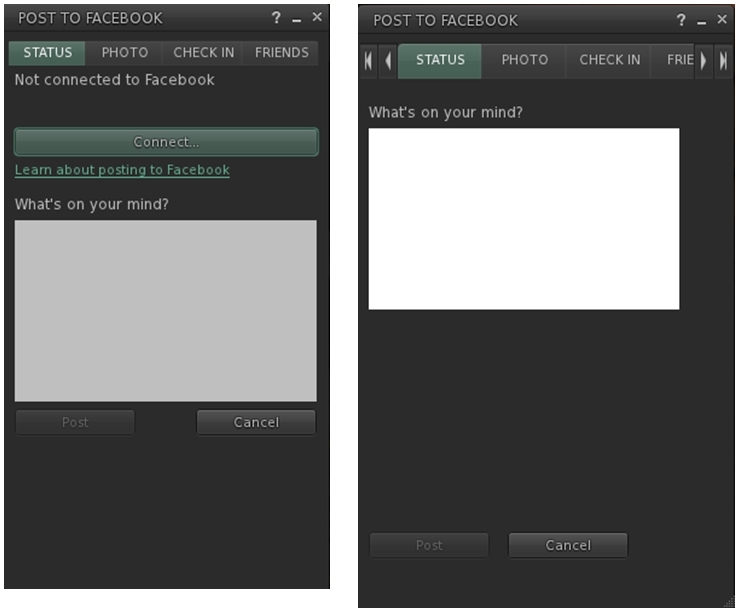 Niran has cleaned-up much of their respective layouts and in doing so has reduced their screen footprints. The results are three floaters that are all rather more pleasing to the eye. Kudos to Niran for the work in putting this together, and to Oz and the Lab for taking the code on and adding it to the viewer. 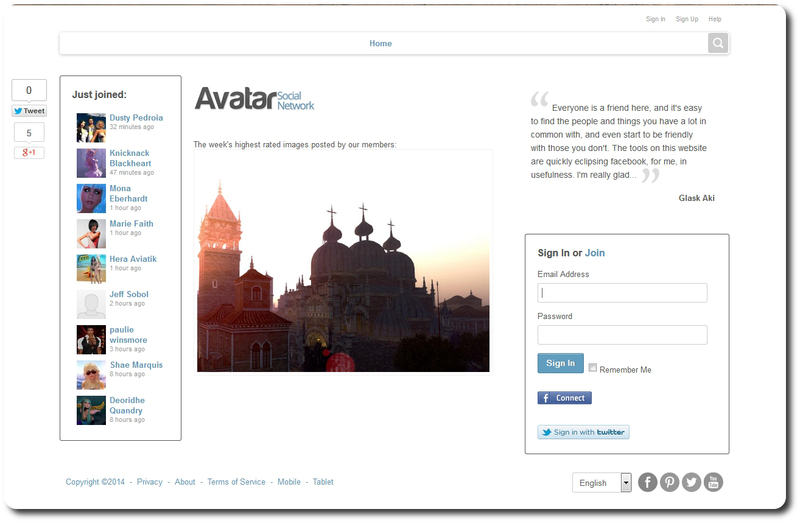 Avatar Social Network (ASN) has been growing steadily since its inception in the latter half of 2013, and is being seen by many users of virtual worlds as both an alternative to Facebook and things like the SL Feeds, and as a useful extension to their social media presence, positioning it alongside their use of existing social media services. Strawberry Singh was one of the more recent SL users to comment on the service, and her blog post, coupled with a reminder of ASN’s existence from Mona Eberhardt, prompted me to take the look at it that I’d told myself I would back in July, when I first happened across the site. Overall, the site’s set-up appears to be along the lines of Avatars United (remember that?) or Moolto, Second Friends. or 2ndHub (with which ASN appears to have the most in common, although 2nd Friends currently appears to be largely inactive). Since opening in September 2013, the site has been gradually refined and improved, addressing various issues and perceived shortfalls. At the same time, it has been gaining popularly among users from Second Life and other virtual worlds. Today, there are getting on for some 2,000 users (a number I’m sure will be surpassed in a short amount of time given the frequency of sign-ups), all of whom seem to be fairly active. The site itself has a fairly clean, easy-on-the-eye design, and fairly straightforward navigation. Signing-up is simple enough; there’s a registration page which makes no call for people to provide real life information. 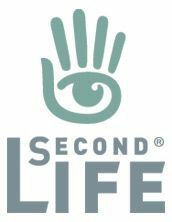 You don’t necessarily have to provide your SL / VW avatar name – it’s entirely up to you as to how you define yourself, although using your avatar’s name and image obviously makes sense from a social connections standpoint. The log-in page also includes Twitter and Facebook links, so I assume you can access the site using verification from these services, rather than signing-up via the form – I opted to go the sign-up route. 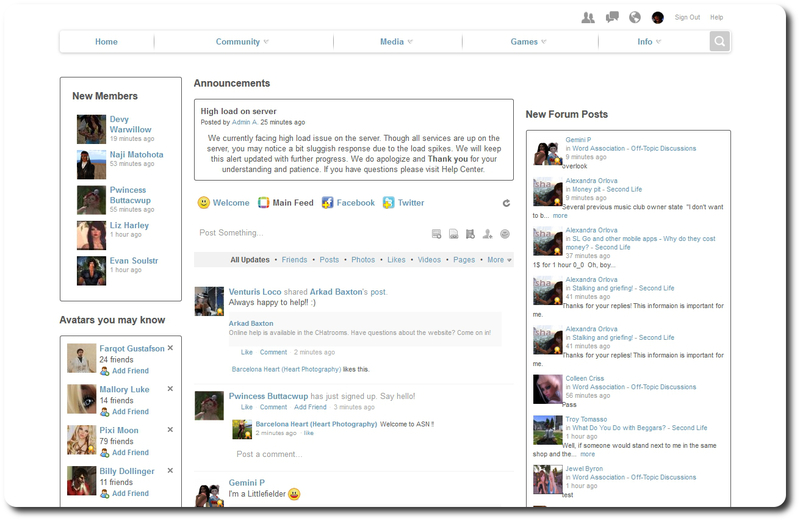 Once signed-up and verified via e-mail, you are taken to the main page, which is split into three main sections – the central feed column, including service announcements which appear at the top; information on those who have recently signed-up, or whom you may wish to friend through the service to the left, and information on recent forum and blog posts, etc., on the right, all of which include various links (e.g. to the forum post in question or to the poster in the case of the forum links, for example, or to people’s profile pages in the case of the friending suggestions and new joiners. A menu bar at the top of the site provides access to public areas and also to your own incoming message centre (Friends requests, messages, notifications) and profile / personal feed link. The Community option in the menu provides access to the core elements of the site – blog pages, forums, groups (think SL groups), pages (think FB pages), ads for in-world employment opportunities, gifts, and so on. The Media option provides access to photos and videos uploaded to the site. Videos can be uploaded from your computer or imported from YouTube or Vimeo (other services pending), while photos can be organised into albums, which in turn can have privacy options set against them (do you want them visible to everyone, friends, etc., who do you want to be able to comment on them, etc.). Clicking on a photo in an album will display it in a window similar in style to Flickr, and with various sharing options (Twitter, Facebook, G+ etc). I’ve not yet found a way of disabling the share options (if they can be disabled) for those who want to keep their images to the ASN site. Photos can be displayed in a pop-up window, somewhat mindful of Flickr, with a space to the right where comments can be recorded. The Games option on the menu allows you to amuse yourself playing various games (some of which require Adobe shockwave), while the Info option takes you to various pages with further information related to the site – including the Rules (! ), and the About page. Down at the bottom of the site is the chat bar and its options. This can be toggled on / off via the icon on the extreme right, and provides options which allow you to access any public chat rooms which may be running and / or set-up your own public or private chat room, initiate direct messaging with a friend logged-in to ASN (just pull up the list of friends logged-in on the right of the bar) and set your availability (or otherwise) for chats.